A new Nature Trail was officially opened on Tuesday 27th September 2005 by the Mayor of Redbridge, Councillor Charles Elliman accompanied by the Mayoress. The project was conceived by sculptor Jeff Higley and planned with the Country Park manager Paul Browne. Woodhenge forms the focal point of the Nature Trail and has four sculptures in place and later another eight representing the life cycles of the creatures to be found in the forest will appear, to complete a large circle which will act as an outdoor classroom, a performance space and a gathering point. 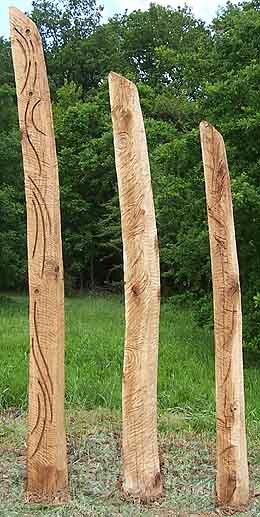 The sculptures are created from oaks felled during the re-creation of a wood pasture area. Local groups and children attended workshops to assist with the carving throughout the process. The site of Woodhenge can be seen from the top of Dog Kennel Hill looking towards the lake and All Saints Church Chigwell Row (below). In declaring the Nature Trail open Councillor Elliman spoke of the importance of the venture and the need for open spaces like Hainault Forest. He praised the work of the sculptors. Jeff Higley in turn thanked Paul Browne for his perseverance, who, despite many setbacks, had finally seen the concept materialise. A Nature Trail leaflet is available at the Country Park Office and Visitors Centre. Paul Browne, Jeff Higley with the Mayor and Mayoress with two youngsters on the Grasshopper bridge near the lake. Woodhenge seen from Hog Hill. All Saints, Chigwell Row can be seen above the trees. Mayor and Mayoress Councillor and Mrs Charles Elliman with Councillor and Mrs Arthur Leggatt former Mayor and Mayoress. Sculptors, Redbridge Adult Education members with the Mayor on Grasshopper bridge. The Mayor and Mayoress at Woodhenge. EARTH AND FIRE sculptured by Jeff Higley. A curving group symbolising WIND sculptured by Cheryl Hughes. The twisting form of WATER sculptured by Kate Pyper. HUMAN INTERVENTION sculptured by Clint Chalonner. Three pointed uprights suggest an early dwelling and other facets of human life are represented by holes, pegs and a mysterious hatch. The additional carvings represent living things past and present that have occurred in the area. Clockwise from WIND, I hope that I have interpreted them correctly. You may see other things that I have missed. PLANKTON Cyclops, Blue-green alga Anabaena, Desmid Closterium, Flatworm, and a Sun animalcule. AMPHIBIA Frog spawn, tadpoles and adult frogs DRAGONFLIES Egg laying on reeds, Nymphs hiding in reeds and adults resting.. BIRDS Owls, geese, swallow, harvest mice on wheat stems.